The Cavalier King Charles Spaniel Club of Qld is a group of like minded Cavalier enthusiasts, who hold regular Shows and Picnics for it's members and other enthusiasts and who endeavour to promote the health and wellbeing of our breed. 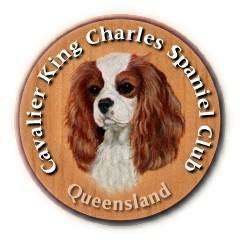 Cavalier King Charles Spaniel Club of Queensland - Devoted to Cavalier King Charles Spaniels and their loyal subjects. Please see our website for information and watch the Club Facebook page for updates.